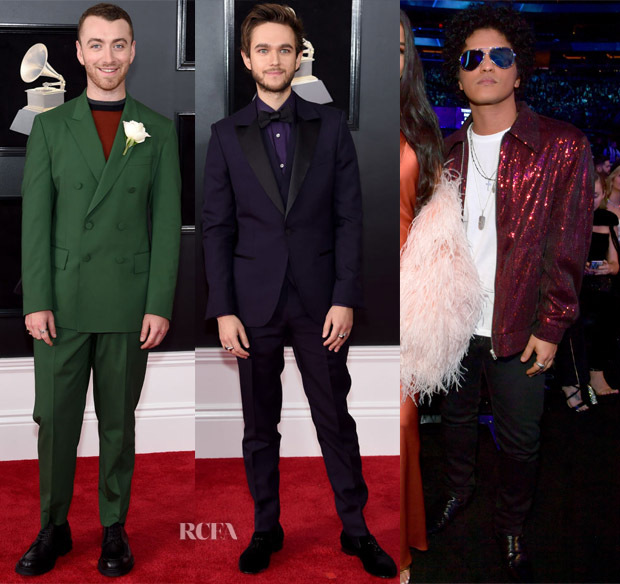 The men brought their fashion game to the 60th anniversary of the 2018 Grammy Awards on Sunday (January 28) in New York City. Zayn Malik: Zayn was dressed to the nines in this mauve Richard James Spring 2018 suit. It was an unexpected hue that I loved on the singer, especially with his graphic twist on the white rose and his patterned socks. John Legend: The singer cut a handsome profile in this Burberry double-breasted tuxedo styled with Chopard cufflinks. I liked this sleek midnight-blue deviation from the standard black tux. Neyo: The rapper was styling and profiling in a Grayscale suit that was boldly striking by virtue of its goldenrod, velvet jacket in which the white #TimesUp rose was the perfect counterpart. Childish Gambino (aka Donald Glover): Monochromatic white lent a pristine effect to this Ermenegildo Zegna Couture ensemble finished with Tod’s slipper-style shoes for a laidback-luxe look. Nick Jonas: I like the classic element that the tweed coat brought to this John Varvatos ensemble, which was made fully current with the ‘Detroit’ T-shirt and skinny dark denim. 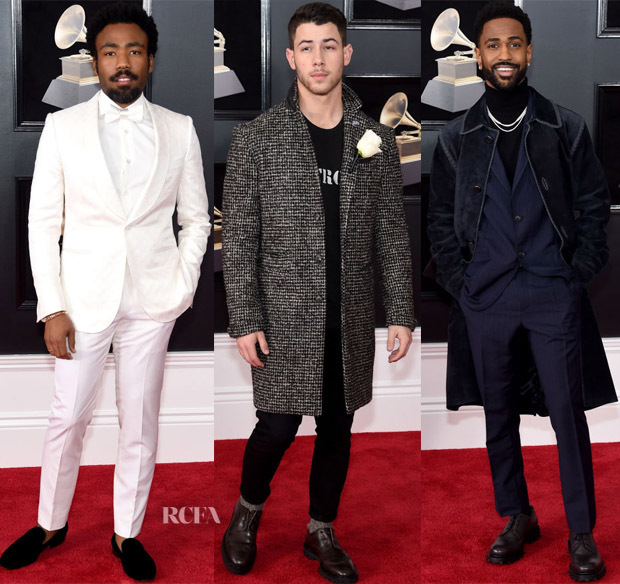 Big Sean: With a head-to-toe look from the Salvatore Ferragamo Spring 2018 collection, the Grammy nominee made a statement in shades of navy by topping the slim-line suit with a suede overcoat for an intriguing flair. Drew Taggart and Alex Pall: The Chainsmokers duo smartly coordinated in complementary Valentino tuxes style with David Yurman rings. I like how the white dinner jacket referenced the white piping on the black jacket. 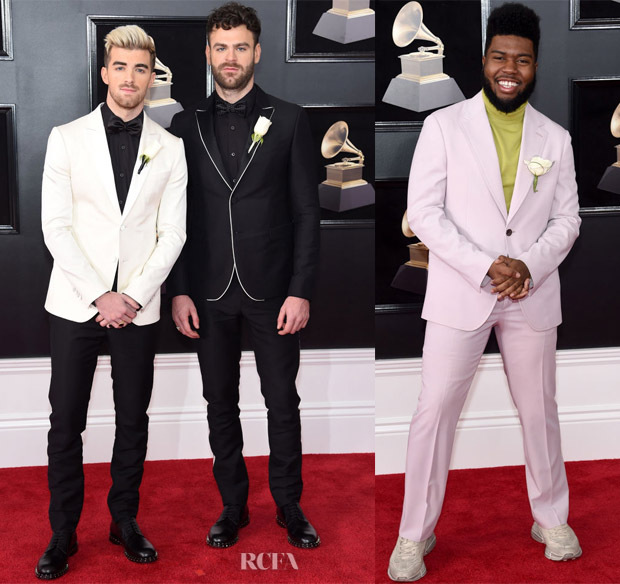 Khalid: The multiple nominee wore a Salvatore Ferragamo Spring 2018 look with sneakers for an urban take on the light suit. Sam Smith: I cannot say I was in love with this forest-green Cerruti 1881 double-breasted suit, but I do appreciate his willingness to colour outside the lines. Zedd: I did love the deep, dark violet hue of this Ermenegildo Zegna Couture tuxedo, which was a beautiful example of classic tailoring manifested in a nontraditional hue. Bruno Mars: He wasn’t on the red carpet, but the glitz of his jacket shone pretty brightly, with sunglasses to shield the glare. 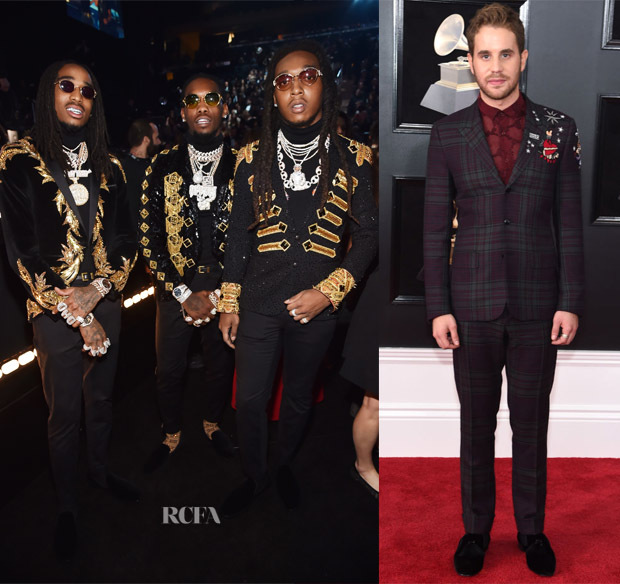 Quavo, Takeoff, Offset: The Migos trio were fully harmonized in Julien Macdonald custom embellished jackets that were almost as glitzy as the piles and piles of chains around their necks and the rings on their fingers. This was hip-hop glam taken to the next level. Ben Platt: The quirky embroidery on this plaid Valentino Pre-Fall 2017 suit is what set it apart—and the stylization didn’t stop there, as a floral-embossed burgundy dress shirt and Chopard jewels completed the equation.